Joe Smith was the manager of The Black Eagles. 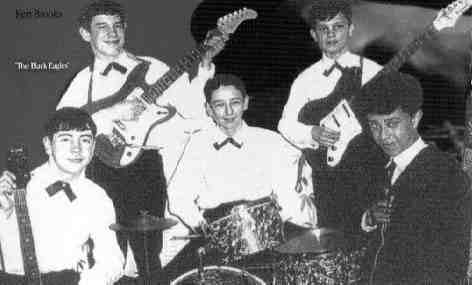 Two of his sons Danny and Frankie were also members of the band. Frankie left the band, some said that he had run off with his girlfriend. Each member of the band was paid 10 shillings per gig and Joe Smith paid for a holiday for them in Butlins once a year. However he totally controlled the band. He owned all the equipment , amplifiers, microphones, guitars, drums etc including the bandwaggon. The only thing that Philip owned was the Binson Echo which he was buying on the hire purchase. Sometime in 1966 The Black Eagles broke up. During this period Philip's favourite hang out was the Go Go Club just off O'Connell Street in Dublin. Philip was friendly with Stevie Bolger who the DJ at the club and he never missed seeing The Grannies Intentions who played there nearly every week. I often gave Philip a lift home on my Honda motor bike. Some times he took taxis. Most of the Taxi-drivers had no idea who Philip was. He used to let on he was a Nigerian student at TCD and would talk in pigeon English to the taxi-drivers. On one occasion when he arrived home in Crumlin the taxi-driver told him that the fare would be 10 Shillings. Suddenly Philip reverted back to his broad Dublin accent and said it was not 10 Shillings but only 7 Shillings and 6 pence as it had been every other night. However the taxi-driver still insisted that it was 10 Shillings. Philip said “ you better take me around to the cop shop then and we'll see what it is.” The taxi-driver then relented and slid a half-crown across the seat to Philip, thinking that Philip would say it's ok, you can keep it. But Philip took the money, pocketed it, got out of the taxi and walked away. Then the taxi-driver jumped out of the taxi and shouted after Philip "I'm glad they shot Martin Luther King" which they had that very day.